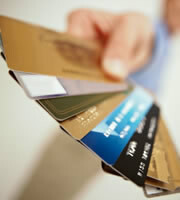 You pay off your entire credit card balances every month to avoid interest payments and stay financially fit. But when you check your credit reports, they show you're carrying credit card debt. The answer is in how credit card companies report information to credit bureaus. Each month your credit card issuer reports the outstanding balance from your last billing statement, according to Fair Isaac Corporation, which produces the FICO credit score. So if you run up $2,000 on your credit cards, chances are your credit reports will show $2,000 in credit card debt, even if you pay them in full by their due dates. To show a zero balance for a particular credit card, pay off the card in full, but then make no additional charges during the next statement period. Your credit reports then show a zero balance. That might not be a bad idea if you're trying to reduce your credit usage ratio--the amount of debt you carry compared to your amount of available credit -- to improve your credit score as you apply for mortgages or other loans. But bear in mind that credit card issuers in some cases are charging inactivity fees and they could even cancel your account if you leave it inactive for too long. Owing money on credit accounts isn't necessarily a bad thing for your credit score. Your FICO credit score, the most commonly used score by banks, considers how much you owe and what types of accounts you hold. Having a small credit card balance that you pay off on time, without ever missing a payment, can show you manage credit responsibly. Paying down installment loans on time also shows that you dependably repay debt. Credit Card Debt: How Much is Too Much? In terms of your FICO score, a large number of accounts with balances could indicate you're over-extended, but simply closing accounts with zero balances won't help you. In fact it could hurt your score because it lowers your available credit and therefore increases your credit usage ratio. The best thing to do is keep your balances under 30 percent of your credit limits--regardless of whether you pay them in full each month. Maxing out your credit cards--spending up to the limits--hurts your score, even if you don't carry the balances from month to month. 0 Responses to "How to Lower Credit Card Balances on Your Credit Reports"